Michigan residents understand the winter. With the cold weather lasting from October until April, we’re always searching for new ways to enjoy it. From excellent skiing spots, to holiday festivals, to cozy train rides and even snowmobile drag-racing, Michigan knows how to keep everyone enthusiastic. You won’t run out of winter activities to do in the Great Lake State, and here are 15 of our favorites. While the notion of going to a water park in the middle of winter may sound a little crazy, this is actually an option. The Great Wolf Lodge in Traverse City, for example, offers a complete indoor water park with an activity pool, a lazy river, and several different water slides. Heated to a constant 84 degrees—which by itself is reason enough to give this park a try, especially at a time when daytime highs aspire to freezing—this offers all the thrills of an outdoor water park but at any time of year. It's not the only one in Michigan, either, so if you're going to a different part of the state, just have a look around. Frankenmuth's unquestioned claim to fame is Bronner's CHRISTmas Wonderland—the capitalization is a point they add to draw attention to the most important part of Christmas—and with good reason. A massive superstore devoted to Christmas trees, ornaments, and similar matters, Bronner's is essentially a slice of Christmas at any time of the year. That can make it fun in summer, and downright vital in late fall and early winter when people are preparing for the actual holiday. For decorating ideas, a way to lengthen the Christmas season beyond its natural boundaries, or to stock up for your own activities, Bronner's offers a slice of that bright holiday season even in the darkest, coldest part of winter. Michigan folks will make it abundantly clear: when it's cold outside, and the wind's howling, and even at noon the sun seems barely up to the task of lighting a closet let alone the world, having a belly full of something hot can make everything feel a little better. While comfort foods vary from pastas to soups to the state's generally-recognized comfort food of a Coney dog, there will be plenty of places in Michigan ready to pack your stomach from wall to wall with hot, tasty treats. One of hundreds of comfort food dispensaries in Michigan, cited by Metro Times, is the mascarpone-stuffed French toast served at La Dolce Vita in the Palmer Park neighborhood of Detroit. That's a thought that could be enough to get even the most hesitant soul out of bed. There's no shortage of places to ski in Michigan, but the Pine Mountain Ski Jump in Iron Mountain is something special. Regarded as one of the best ski jumps in the world, and home to what's considered the best ski jumping tournament in the United States, the Kiwanis Ski Club, the United States ski jump record was set here and is still held here at last report. Matching the record would require you to jump 459 feet, or a little under a tenth of a mile, and that's easily one of the most staggering jumps most will ever see. Racing in Michigan is a well-known phenomenon, but most people might think that when the snow and ice start flying, that race action must stop. That's not the case, though, as in Michigan, we just switch machines. Snowmobiling is a popular pastime, and sometimes it takes on an even more exciting cast with snowmobile-based drag racing. One such event is the Tip Up Town snowmobile race held in Houghton. While it won't be the only such race around, it's one of the biggest with two separate tracks, one for snow track racing and one for ice track. Those who enjoy boating know first-hand that Michigan has plenty of options. Even the grandest of mega-yachts can find a comfortable home on Lake Michigan, or most any other Great Lake for that matter. The fun doesn't stop just because the weather gets cold, however, as iceboating in Michigan is a major phenomenon. The DN class, as it's called, is one of the biggest racing classes in the state, and given that maximum speeds can reach up to 10 times wind speed, those who like a high-speed thrill will likely find it on one of Michigan's many lakes. If there's a hill in Michigan, it's going to get snow on it, and that's going to offer an opportunity for visitors to slide down said hill on a variety of devices. Sleds, skis, and more await, but one of the greatest is the inner tube. 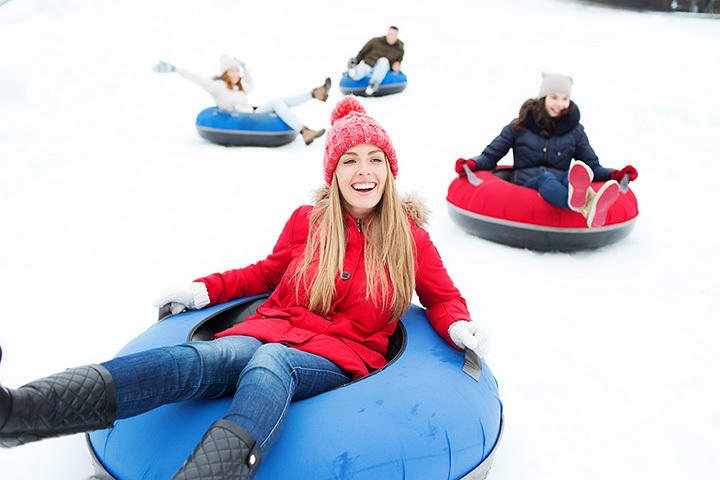 Snow tubing provides all the speed and excitement of anything else, and Timberlee Hills in Traverse City will be one of many, but possibly the best around. While the ride down is fun, the walk back up the hill can be a trek. Timberlee Hills, however, has a tow system that allows users to just slide back up to the top without incident. For two weekends a year, the Little River Railroad in Coldwater turns into a special holiday attraction: The Christmas Express. Requiring pre-purchased tickets and a careful adherence to the schedule—the event doesn't wait for latecomers—the Christmas Express will offer visits with Santa on the train itself, as well as a tour of the train depot and a set of specific holiday-related treats. Plus, there's the added inducement of riding an old-style steam locomotive throughout the countryside, which is a draw for a lot of people. Snowshoes are known as those comically-oversized affairs that try to provide some extra traction thanks to their width and length, but they're not just the fodder of cartoons: they exist, and they can provide an unusual walking tour. Coupling these with a walk on the beach and you're straddling seasons in a fashion so ludicrous that you may not be sure whether you should pack a coat or swimwear. The Muskegon Winter Sports Complex runs several such tours, including one that goes out to Lake Michigan, complete with rental snowshoes available. Just about anywhere that offers hiking has snowshoe opportunities. When Reader's Digest and USA Today can agree that a holiday event is a big deal, then you know you've hit a winner. Running throughout December, Holiday Nights in Greenfield Village in Dearborn offers a host of holiday-themed options for patrons. From celebrations of the vehicle—including horse-drawn sleigh rides and of course Model T rides—to demonstrations from artisans and holiday-style cooking, there's plenty to check out. Despite the cold and dark, however, stick around to the very end around 10 p.m., as there's a firework show with singalong every night to cap off the event. Featured all over the state, fat biking involves bicycling on specially-designed bicycles with fat tires geared toward providing traction in sand...and snow. Several such events take place around Michigan, so those who miss the high-speed thrills of mountain biking in winter can get them back with fat biking. Down Wind Sports in Marquette offers a complete training package in a trip form, complete with gear rental, that teaches patrons how to climb a wall of ice. Given that some of the best waterfalls in the state are in the Upper Peninsula, turning to these as climbing gyms in the colder months is just a natural idea. You've just seen a host of activities and things to do in the cold, and after all that, you're likely cold, maybe a little wet from all the snow and probably a little tired. After all that, it's nice to turn to a good cup of hot chocolate to warm up the body and perk up the attitude. It's no coincidence that National Hot Chocolate day is in January, so celebrate it with a cup of hot chocolate. One of the best in the United States, as cited by Food & Wine Magazine, is found at Zingerman's Next Door in Ann Arbor. Devoted to desserts and take-out items, Zingerman's Next Door is a common stop following a hit at Zingerman's proper. As for the hot chocolate, the Mindo hot cocoa is made with a small-batch chocolate recipe made in Dexter, Michigan, making it especially potent and rich. The good news about this is that it can be done pretty much anywhere you can find an open field, and there are plenty of those around Michigan. Corn field, bean field, prairie, valley, whatever; just find a big flat field and watch the snow on the ground for a bit. Watching during sunrise or sunset adds a few extra colors to the process, and the scintillations of sunlight on snowfall can result in a prismatic experience that shows Michigan's crystalline beauty for the cost of a little time spent watching. Be careful with this one, though, as the glare can be pretty substantial and potentially blinding. Plan accordingly.